Your water line is the main pipe bringing clean water into your business from the Collinsville, IL civic system. That makes it one of the most important parts of your business, regardless of whether you’re involved in food preparation, retail service or simply need the sinks and bathrooms in an office building to work. You need someone in your corner who knows how to take care of a commercial water line, whether it’s installing a new one or performing maintenance and repairs on the old one. Embrich Plumbing Co is just such a company. Our trained staff has extensive experience in dealing with commercial properties, which means we know the difference between your specific needs and those of the average household. Whether you’re replacing a broken water line with a new one or you need an emergency repair job fast, we’re on the case and ready to go when you are. Give us a call today and let us show you what we can do! Trust Embrich Plumbing Co with commercial water line services in Collinsville, IL. The installation of the water line in a new commercial property can be a daunting prospect, since it usually has to take place early in construction before the main building goes up, and it needs to be laid down properly in order to ensure that there are no problems further on down the line. 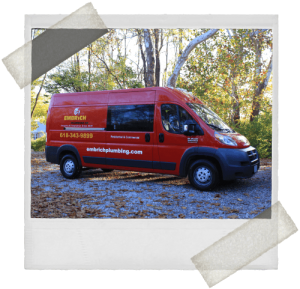 Here in Collinsville, IL, you need to depend on a good plumbing service to help with the planning, to look at the water line in relation to the property itself, and to perform installation in such a way as to keep the overall project on track. You can trust Embrich Plumbing Co every time to handle those duties. Commercial water line repairs tend to involve the usual suspects for plumbing problems: clogs, breaches, and the occasional intrusion by tree roots into the system. The difference is that you can’t afford to wait, since commercial space without water is a massive inconvenience at best and a disastrous loss of service at worse. You also need to handle the tricky issue of exposing the water line in order to reach the repair spot, which can be especially hard in our Collinsville, IL winters when the ground is frozen. A good service can be worth its weight in gold in such circumstances. The tricky thing about commercial water lines is their underground placement, making it difficult to detect potential problems or enact suitable repairs. The solution is to hire a company that not only utilizes the right equipment, but has the experience to do the job right. Embrich Plumbing Co utilizes miniature video cameras, hydro jetting, and similar methods to keep the digging to a minimum and ensure that your commercial water line is installed and/or repaired the right way the first time. When trouble arises, or even if you just need some maintenance performed, you can trust us to do the job the right way. Give us a call today and let us take care of the worrying for you!